Get Paid to Test Apps, Websites and Games – Yes, Really! Here’s a cool extra cash opportunity! Companies hire test IO to get feedback on and find bugs in their apps, websites, and games. To gather that feedback, test IO enlists the help of people like you. 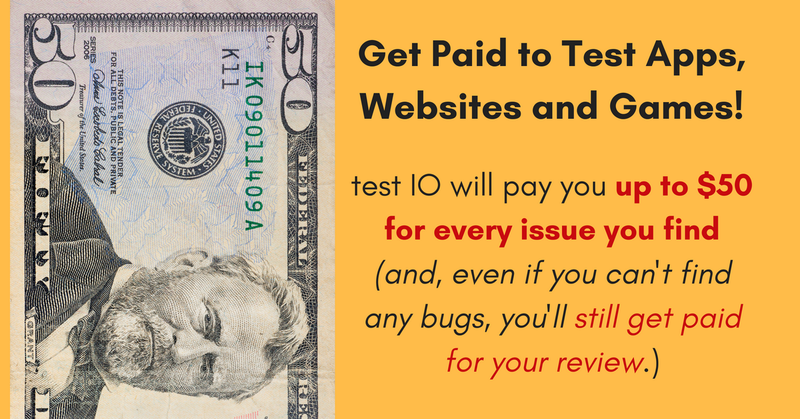 They’ll pay you up to $50 for every issue you find and, even if you can’t find any bugs, you’ll still get paid for your review. “How much can I earn? – Most tests pay by the bug. You earn more money for more critical bugs — up to $50 for the most important bugs. You can also earn guaranteed money by reviewing apps or completing scripted test cases. When/how do I get paid? – We pay once per month using PayPal, Payoneer, Skrill, or bank transfer. What devices do I need to test? You will need access at least to a desktop computer. Beyond that, the more devices you have, the more opportunities you will have to test. Most testers have one or more mobile phones, and some have smart home devices and wearables. You don’t need the latest gadget; there are plenty of tests on older phones, and many great bugs to be found! What if I don’t find any bugs? – It can be hard at the beginning, but don’t worry! Depending on the test you may have the opportunity to provide feedback, run test cases, or reproduce bugs that other testers have found. It’s helpful at the beginning to think of test runs as practice — you’ll improve with more of it. What happens if I can’t accept an invitation? – We want to work with your schedule, so there’s no penalty for not accepting an invitation. It’s helpful to let us know if you can’t test so we can offer your place to someone else right away. Please test if you say you’re going to — it’s good karma and better for your fellow testers. How can I improve? – Our tester academy has good resources, and there are many web sites that will help you hone your craft as a tester. We find that testers improve a great deal by participating often and observing what senior testers do. The reproduction feature lets you get paid for verifying bugs that others have found, and it can give you insight into their thought processes. The more you test, the more you will see patterns for where bugs are found. Click here to learn more and to sign up to become a tester. For more jobs like these, check our Newest Jobs & Gigs page. To be the first to hear about jobs like these, like our Facebook page. Good luck in your next steps toward working from home! This entry was posted in Earn Extra Cash, Work at Home Jobs and tagged test IO. Bookmark the permalink.